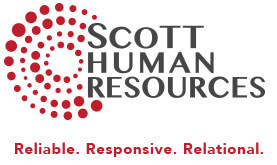 Scott Human Resources started serving clients in 2008 with a primary goal to partner with companies that desired the assistance and unbiased perspective of an outsourced human resource consultant. The company has steadily grown to serving more than 100 organizations and has touched the lives of more than 10,000 employees. Human resources plays a critical role in balancing business and employee needs while ensuring positive forward progress. Scott HR is a perfect match to guide you through HR decisions and deliver timely solutions that will add to bottom-line revenues, productivity and enhance employee morale. Kristin’s HR career begins at the regional franchise headquarters where she eventually oversaw both the Topeka and Emporia offices. Kristin partnered with more than 40 offices in 4 states for marketing, sales and training. Active in the local chapter of Society for Human Resource Management (SHRM), Kristin served as the 2002 and 2003 president. As a human resource consultant Kristin begin delivering training and consulting services. Kristin started co-chairing the People Between jobs ministry at Topeka Bible Church. Karen Bodner joined the consulting team as an HR assistant. Kristin earned the SHRM Certified Professional designation. Kristin serves as a board member for the Topeka Independent Business Association and has been appointed to the Topeka Chamber of Commerce Small Business Council.